I'm not mad or anything... But I must say making Cap and Thor in regular suits would've been the better choice. That way, if people want those two in Quantum suits, they could just do head swaps. If DST was making any sort of attempt to evolve minimates or be creative I’d be more understanding but things like@DSTZach ﻿just confirming that 2 of the 8 Walgreens mates are just Quantum suit Cap & Thor shows that DST isn’t even trying. I think we have evolved Minimates, but what do you think they should evolve to? We added the BAF, we've developed the advanced head-swap technology we used on the Strike Force wave and the Endgame sets... do we think adding articulation or more accessories is going to affect sales? If by evolve you mean animated series or movie deal, those are obviously very nice forms of evolution indeed. I personally think Vinimates are kind of an evolution of Minimates, in their own way, but I can see how that might not be everyone's favorite route. they're actually saving us money. if you had to buy 3 box sets to get everyone in the suit, then that would leave you with another extra war machine, an extra body, and you'd be paying $25 for those two figures as opposed to $10 at walgreens for those 2. now the bad news is we're all thinking that this means we won't get the new outfits for cap or thor. anyone else here now thinking of the malibu stacey episode of simpsons where people freak out b/c she has a new hat? Fun fact: Cap and Thor are actually a head swap of each other! So if you want the full suit team, you'll need to buy two of that two-pack. I think that's the only other multiple buy you'll need. There are actually a few characters we're duplicating in silver suits AND their other suits (Widow, Tony, Barton, Rhodey, Hulk), but Cap and Thor are not them. i guess get ready for people bitching about having to buy 2 of those 2packs now. and there it is though, that will now be the most sought after pack. I think DST has just been dealt a bad hand in the last few years, and it feels like everyone is giving them a bad rep more and more. For what it's worth, I feel they're trying their best with what they have going on. Sure, I want things to be better, but I'm also grateful for any kind of release we get, because it shows that this is a line that DST wants to keep going. Back on the Endgame stuff, I quite like the uniform look of the quantum suits, I just think it's awkward to see someone like Cap or Iron Man with their regular blue or red helmets on top of the relatively drab silver bodies. At its peak, Toys R Us had 1,450 stores around the world. I think Minimates has had worse champions. Zach, does Thor get Stormbreaker this time? Are there any chances of SDCC exclusives for missing characters or alternate looks? I'd go further to say that the toy/collectibles industry has evolved away from what Minimates are, and that you guys have responded to that in pretty substantial ways. So from what you’re saying, it seems like we might get an army builder with the cap/Thor pack? If they’re heads swap for the same body, it seems like that’s where you guys are going with it, right? I was going to talk about distribution, and had even started to type a response, but Fwoosheyman's last statement made my head explode (which is not an emoji, apparently). I imagine if we HADN'T finished the suited team, then we would ALSO have been accused of not trying? No I’d say that was a smart decision and they are easy quick customs by using minimates main & best feature which is parts swapping. You can’t make a Cap or Thor in their Endgame costumes. We never got Thor in this outfit in the Inifnity War waves so this is twice it’s missed. If there was a second wave/more releases sure go for it and make both versions. But if we only get one make the more interesting versions not the quick custom versions as a regulat release. As @Minimate said I’d prefer to have to buy another boxset then to not have to buy another boxset and not get Cap/Thor in street gear. DST exists to sell product make people want to buy more product. Advertise in the two packs “hey kids! want Cap and Thor in their quantum suits check out this boxset and use minimates swapping feature to create them”. Encourage more sales not less. No that’s not what I meant, the product is fine. Offer them in different more creative forms than just standard two packs and 4-packs. Something that makes them stand out on the shelves wether it be something like versus/battle scene packs or team packs. How about a wolverine/Sabertooth 2pack w a little snowy cliff/ground piece they can be posed on and used to create your own little scene. Perfect for a single purchase for a desk but can be combined w others to create something larger. You want Jim Lee X-men here’s a team pack of something like Wolverine, Cyclops, Jean, Gambit, Rogue & Storm. Stick to we’ll known groupings and one buy packs that gives the buyer a complete team. Think of it as a new form of the “best of” minimates if stores want multipacks and not waves of 2packs. Go beyond movies, not making product for the Spiderman PS4 game was a missed opportunity. It’s was HUGE and sold over 9 million copies. 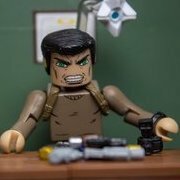 Having merchandise for it when it released could have gotten minimates back into stores like GameStop, etc. Vinimates designs are great but they just make me want them in minimate form (DC movies especially 😫). I’m not a statue guy, I want to be able to move the collectible into a pose I want. Also I don’t have the room for them. Thanks for the sneaky peaky. I think the only criticism I can make of the boxset is that maybe it should have included the Thor/Cap combo instead of War Machine, that way you could get two sets and not have extra 'mates left. Ah well, that ship has sailed, and I trust DST had some reason for doing it the way they did it. Interested to see what the companion wave ends up looking like. BINGO. One of the huge appeals of Minimates is their diminutive size. I can have a large collection in a small space. The few Vinimates I have (Dr. Manhattan, IronGiant, Cthulhu) are simply placeholders for larger Minimates. War Machine might have three different armors in this flick. Rhodey could have his own 4-pack. No offense, but these are not great ideas. i'm sure there was a bit of mix and matching and thought that went into this.